This workshop by National Geographic Photographer Gerd Ludwig is for professionals and serious amateurs who want to take their photography to the next level. It concentrates on the aesthetic, technical, and logistical aspects of photographing with personal vision and balanced objectivity. Limited to only 9 participants, it is designed to help photographers develop a personal eye and leave inspired. Participants will meet at Gerd's unique home in the Hollywood Hills for 1 ½ days of portfolio reviews, instruction and theory, before shooting for 3 days at California's Salton Sea. A day in LA filled with editing and sequencing, followed by a joint presentation of the final results, concludes the workshop. Diversions, Subtleties and Devotion: Five Photographic Visions: Co-organized by Venice Arts and Month of Photography Los Angeles (MOPLA), this exhibition curates the work of five photographers -Kristen Bedford, Rachel Bujalski, Allison Pharmakis, Josh S. Roseand Lev Rukhin — each bringing a unique perspective to MOPLA’s 2016 theme: Diverse/City. Diversions, Subtleties and Devotion encompasses a variety of documentary visions into the people and places that make our contemporary cities—as well as more far-flung places connected to them only tangentially—vibrant, interconnected, and diverse places to live. Josh S. Rose and Lev Rukhin surreptitiously capture photographs of the often-overlooked communities and characters of Los Angeles’ neighborhoods. Kristin Bedford and Allison Pharmakis take deep dives into enduring communities of faith in Philadelphia and Los Angeles. Traveling through high desert, national forests, city marinas, and coastal and mountain towns, Rachel Bujalski takes portraits of people living an alternative American Dream—off-the-grid residentially, but plugged in technologically. Together, these artists’ photographic series take us inside worlds both all around us, and utterly new. Exhibition Runs March 4 - April 7, 2016. See more here. Join us for a Panel Discussion from 3-5pm focusing on what makes an abstract fine art photograph, and the process artists use to achieve them. Moderated by Curator Juri Koll. Abstract Photography has a long, illustrious, inspiring tradition, which extends to contemporary photographers’ work. Abstract Never Is conveys the concept that an abstract photographic image never truly escapes the process of putting the lens in front of the eye and clicking the shutter. The moment of conception of an abstract photograph requires intention, place, surface, object, and time, to mention a few aspects. If it is successful, it thrives on the border of the known and the unknown. The moment and the timeless. A successful abstract photograph requires both - and balances on the heft of each. This show places contemporary photographers who practice abstraction as an important way of seeing the world in the pantheon of well known abstract photographers such as Edmund Teske. Artists: Fatemeh Burnes, Sasha vom Dorp, Kio Griffith, Diane Holland, Suda House, Juri Koll, KuBO, Lawrie Margrave, Stefanie Nafe, Kirk Pedersen, Osceola Refetoff, Lisa Rosel, Edmund Teske, and more. Exhibit runs through April 9, 2016. Society of Publication Designers presents Yes to the West: Unsung Heroes of the American West Vol 12: Keeping it Real. A gathering and projection presentation of artists who are keeping it real. Artists are revealed that evening and presented by Chloe Aftel, Sam Comen, Stephanie Gonot, and Ryan Young. 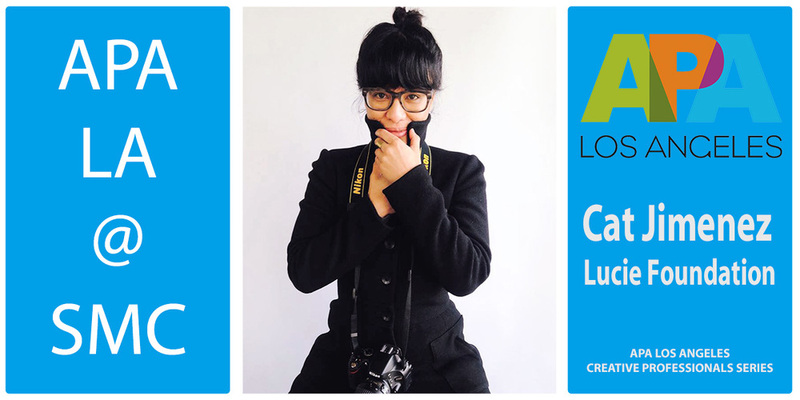 Join us Tuesday, April 19th at APA LA presents Cat Jimenez and The Many Roles in Photography, as told by an Advocate, an Agent, a Gallerist, and a Photo Editor. This multi-panelist roundtable discussion will delve into the multitude of career paths and possibilities within the realm of photography, lead by artist advocate, Month of Photography LA's Co-Founder, and Executive Director of the Lucie Foundation, Cat Jimenez. Pricing and negotiating are aspects of business that you can only get good at if you have the right tools. What types of estimates are actually getting approved? If you know the right questions to ask, have a solid grasp on industry standards and also understand the current fluctuation of what clients are willing to spend, you will increase your chances of bidding those big jobs successfully and growing your business. During this event, ASMP LA presents an industry leader who will discuss perspectives from both the side of commercial photographer and from the art producer's side of the door. Join us on the upstairs terrace at 8pm for refreshments and to view our second showing of our annual photo contest, "Awakenings"
An intimate discussion featuring a special guest moderator in conversation with Charlotte Patterson. This discussion will explore concepts of impermanence and immortalization in photography and how it has influenced this new body of work. This event is in conjunction with Gertrude. Gertrude offers Salons - intimate events to learn, discuss and collect art. Wine and cheese will be served. Earth, wind, water, and metal are the key elements in this stunning show by Los Angeles bred photographer Charlotte Patterson. Through her dynamic photographic process of forced decay and rebirth of an original image, she forces the viewer to reconsider traditional modes of perceiving and displaying photography. Moving away from the literal and into the abstract, Patterson infuses the viewing experience with ideas of ephemerality and immortality, the artist’s lens ultimately bringing focus to the beauty between the lines. Art Salon: In Conversation with the Artist Saturday, April 30, 2pm. Sat, April 23, 2016 // 7-10pm: Exhibition viewing + Pro'jekt LA Part Four of MOPLA's Projection Series featuring a selection of images submitted to this year's call for participation by photographers worldwide, in addition to images from current ASMP LA members curated by Yasmin Alishav. Exhibition on view through May 14, 2016.